After a busy festive party season in December, we might all need a bit of a detox. But that doesn't mean tasteless drinks (or having tap water only!) and not having any fun. So if you've chosen to go teetotal this January, or just to have a little less alcohol, here are six excellent mocktails to brighten your month. Add granulated sugar and water to a small saucepan and heat over medium heat until sugar dissolves into the water, stirring occasionally. Boil for about 3 minutes until liquid has become syrupy. Set aside to cool slightly. Store covered in refrigerator until ready to serve. Serve chilled with garnish, if desired. Juice the lemons, and remove any seeds. You should yield about 150ml of lemon juice. Combine the lemon juice and honey in a high speed blender and blend until honey has fully dissolved and the concentrate is frothy. Divide the concentrate evenly into 4 glasses, or pour into a pitcher. Sprinkle the lavender sprigs over the concentrate, then fill the glass/pitcher with sparkling water. You can either chill the sparkling water prior to serving or add ice if you prefer. Add some chopped fruit to a large jug, filling it about 1/3 way. Pour the juice and soda water on top and gently stir. Serve straight away and enjoy! It can be kept in the fridge for up to 12 hours. Place 6 mint leaves in the bottom of a tall glass and press down with a muddler to extract the juices and flavour. Add apple juice, lime juice and elderflower cordial to the glass. Using a jigger, measure 30ml of apple juice, 20ml lime juice and 15ml elderflower cordial into the glass. Fill the glass with crushed ice and stir the drink with a bar spoon. Top up the drink with 40ml Soda Water. Place a sprig of mint at an angle against the rim of the glass to garnish. Fill a beverage glass halfway with ice. 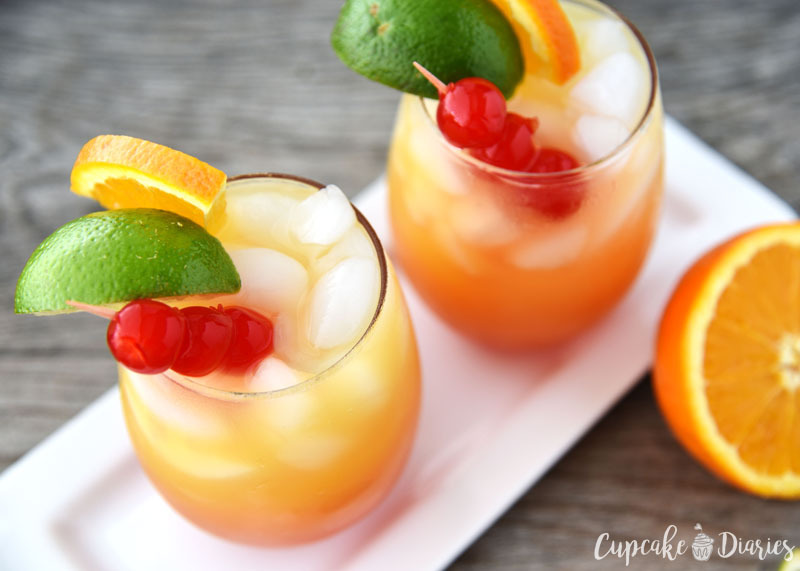 Add lemon-lime soda, pineapple juice, orange juice, and grenadine. Top with orange slice, lime wedge, and a toothpick skewered with cherries. Serve with a straw.